“The True Song of Your Heart” – Ce Soir Arts – Be inspired tonight! I always enjoy a good story. I enjoy a good song as well, and I get both when a true poet who always shares his heart and his wisdom, PonDman Haalan, performs his ballads at the Ce Soir Music and Arts venue with sensitivity and insight. Nearly every song is a story about fractured, vulnerable people like ourselves, trying to connect with others and express their true feelings but often blocked through their own tragic flaws and limitations. That one day he’d want her for his own . . . . Boy, you’d better not go. To Evangelina in old Mexico. PonD also tells the moving story of Jerry Jeff Walker’s character “Mr. BoJangles” who “. . . danced for you, in worn out shoes./With silver hair a ragged shirt and baggy pants,/The old soft shoe.” When BoJangles’ dog passes, we grieve with him just as we grieve for the other characters sung about in the other songs in PonDman’s repertoire. PonDman’s motto is “Sing the true song of your heart.” As fractured people in kinship with the characters in these songs ourselves, we feel PonDman Haalan sing the true songs of our hearts as well. We identify with each of the characters in these ballads as they come to life through his sweet and skillful renderings. PonD is about the real deal, and we always enjoy his singing, playing, and warm banter. 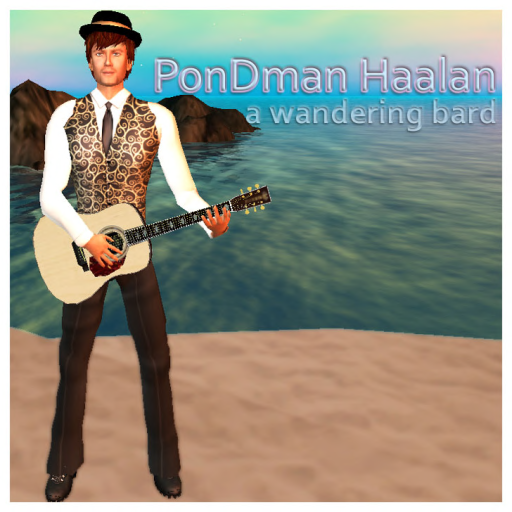 Come hear PonDman sing the true song of your heart when he performs at Ce Soir Music and Arts venue every other Wednesday starting July 11, at 2 pm SLT. It’s Americana at its best! Next Sunday Night – Two Don’t-Miss Shows!